My very first knitting book is being released this month (June) and I am very excited that this new chapter in my life has begun. The book, Hats to Knit, features 27 handknit designs that will take you from the skifield to the office and to a garden party. We are launching the book at Paradox Books in Devonport, Auckland on World Wide Knit in Public Day (WWIP Day). Knitting and chatter and book signings - what a great way to spend the afternoon. I was recently introduced to this book, which was published in 1915. Remarkably it is still available in public libraries in New Zealand. 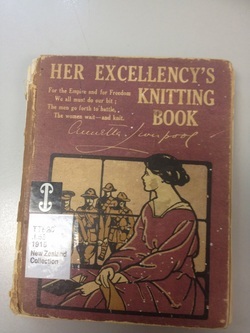 The wife of the then head of state wrote a book of some 192 pages of knitting patterns - all of them useful and many with wartime application. Working my way through the book, I was struck by a couple of things - one was the pattern for a cholera belt. A cholera belt? Thankfully the book and google explained its usefulness. The cholera belt was worn around the midriff to protect individuals from contracting cholera. They were right, cholera was linked to the mid regions of the body, so the intention to draw heat and moisture from this area might have seemed logical. The reality is that cholera is a water- and food-borne bacteria. It is one of the few bacteria that can survive in the acidic gut - bad luck. Consuming water and food contaminated by faeces is the mode of transmission, the belt could not possibly have any effect. When the soldiers went to India they were encouraged to wear the belts and change them frequently when they became wet with perspiration. One can only imagine what ti was like to wear itchy wool next to the skin in that heat. Remember, there were no possum blends, or soft merino yarns on the market. The other distinctly different feature of this book is the lack of pictures and rather scant instructions. The book tells you to increase 9 stitches evenly across the row and you are expected to be able to manage the calculations. Women of last century were clearly more competent in mathematics than we of today - we who require explicit instructions - knit 8, increase by knitting into front and back of stitch and repeat. And many of us need pictures to show the increase - those women did not, they just knew what to do. The final proof will be in the knitting. I am planning to make a few of the items. I shall start with a cholera belt - you just never know when you will need one!